The Botswana ministry of environment, wildlife and tourism said it would strengthen legislation to ensure that this “abhorrent and unethical practice does not find its way into Botswana under any guise”. “We are committed to conserving our biodiversity, large carnivores included, and we do not tolerate cruelty to our wildlife in any form,” the ministry said in a press statement released at the end of March 2014. The announcement was in response to an Oxpeckers cross-border investigation into the export of lions from Botswana to canned hunting facilities in South Africa (oxpeckers.org/2013/12/botswana-minister-in-lion-trade-scandal/). In late 2013 Botswana’s minister of agriculture, Christian de Graaff, shipped 22 lions to the Makhulu Game Farm near Boshof in the Free State. 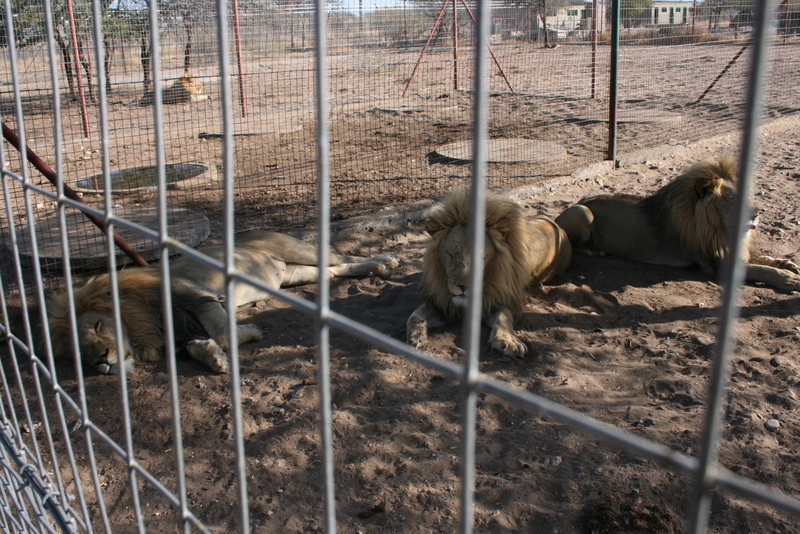 Employees at the facility, owned by Henk Vorster, openly discussed how the lions were hunted and their skeletons were sold to Asian buyers to supply a growing market for lion-bone tonics. The cross-border investigation by Oxpeckers reporters featured prominently in the Mail & Guardian and Volksblad newspapers in South Africa, and in Mmegi newspaper in Botswana. As a result, Tshekedi Khama, Botswana’s minister of the environment, wildlife and tourism, said he had instructed a team of investigators to determine whether fraud had been involved in the sale of De Graaff”s lions. Oxpeckers investigations have revealed that South African farmers use cattle-rustling routes in the Northern Cape to smuggle wild lions and other predators out of Botswana to supply a growing demand for lion-bone potions in the Far East. Conservationists said the illicit trade by organised cartels was adding to the pressures that could see the extinction of big cats in the wild within 10 to 12 years. On March 15 thousands of protesters took to the streets in more that 60 cities around the world to protest against canned lion hunting, dubbing it “South Africa”s shame”. More than 1,5-million signatures were added to a petition calling on the South African government to ban the practice. “Canned” hunting is the term for the shooting of wild animals in small camps, or using drugs to tranquillise them, luring them with sound, scent or bait, shooting them from the back of a vehicle or at night, and using dogs to corner the animal.